I’m not saying I’m perfectly organized. I’m no Martha Stewart. I have crumbs on my counters, toys all over my living room and a pile of magazines from the past six months that I haven’t read. 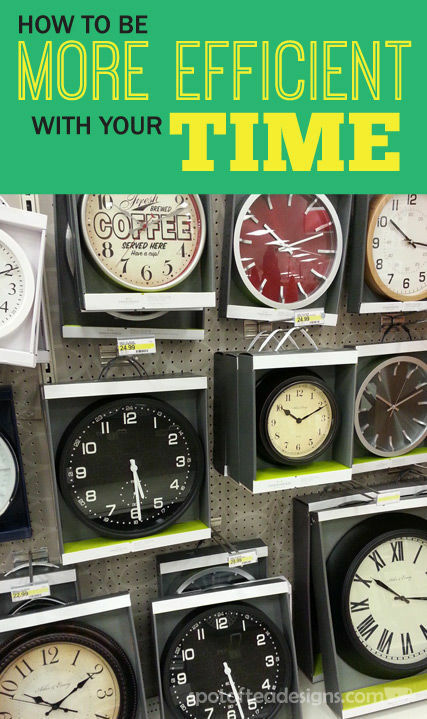 For the sake of the whole New Year Resolutions thing, I’m sharing a few ways to be more efficient with your time to kick off 2015 with a more organized life! Write to do lists. Having goals written out helps you focus on what needs to get done. Crossing things off your list is also such a visual pat on the back to keep you motivated for future tasks! Use a digital calendar. Sign up for a Google calendar and share it with your partner or family members. This allows you to see who’s doing what and when. My husband and I use ours ALL THE TIME as it’s displayed right on the homepage of both our smartphones but also connects to our emails. It’s accessible at work, at home, or when we’re out making appointments. Start the morning by setting up or completing a self-sufficient chore. By this I mean setting up the washing machine, dishwasher or some other task that can be completed while other things are happening. If you don’t want to have machines running while you’re not home, at least put the items in and add the detergents so it’s all ready to be turned on when you return home. Meal plan. Sit down and read through the grocery ad with two papers nearby: one for the grocery list and one for the menu for the week. Display your menu someplace where other family members can see so they can help you remember if something needs to be defrosted for that night or can help you prepare when it’s time to get cooking! Bonus: meal planning helps you save money as it will allow you to use ingredients made for multiple days of the week. Our favorite thing to do it grill chicken one day and use it for wraps, fajitas or quesadillas during the week. Set up payments of your bills. Most credit cards, insurance plan and utilities can be paid through online banking these days so use these opportunities to your benefit. For items that are a set payment date and amount every X month(s), like car insurance or a mortgage payment, set this up as an auto payment. For other bills that are different each month, set up the payment THE DAY YOU GET THE BILL. I’m not saying you have to PAY it that day but sit down and set up the payment to happen the day the bill is opened. This way you won’t forget, missing a payment and receive a late charge. Get creative on where you find time. When working on Brielle’s Halloween costume, I packed myself a bag with all the cut pieces, thread, needle, and travel scissors. When I was a passenger on a long car ride, I pulled out my sewing kit and got to work putting a few pieces together. If you’re not prone to sea sickness, don’t let that passenger time go to waste! Use folders in your email. Anyone who has ever worked with me knows that I love my digital folders and my spreadsheets! These two digital tools can help create an organized digital space so I can have a quick and efficient experience online. Take the time to turn that messy inbox into a beautiful archive of your written correspondence. Create folders about topics (example: bills, online orders) or separate them by events (example: wedding planning, baby showers). If you feel the need to keep EVERY email from a specific person or email newsletter, create a folder for it and it get it out of your immediate inbox. If you’re a blog reader, unsubscribe from email newsletters and use Bloglovin! Bloglovin allows you to read all the blogs you love in one place. Once you create an account, you add all the blogs you love to your account and read through them in a news feed format. There’s no social media marketing posts to sift through or millions of emails in your account. You can download and read the posts through an app on your smart phone, read it right on the website or get one daily digest email sent to your account to read. Sign up to follow me on Bloglovin here! Unsubscribe from newsletters you never read. Sure you ordered that special gift from that one online retailer three years ago and you’ve been stuck on their mailing list ever since. You NEVER read their emails but just casually click “delete” when it comes in. Why? UNSUBSCRIBE! Seriously take the time to sit down and evaluate the time spent in your inbox and whether the content you’re receiving is really something you want to continue to get. You can always sign up again if you feel you’re missing out. If you like the content of this post, you may also want to check out my “How to organize your digital photos” post for additional digital organization guidance!